Well, no, not really. AEK was scheduled to play Dundee in Europa League action tomorrow. The problem is, AEK's pitch was in poor condition so they agreed with rival local club Panionios to use their pitch. 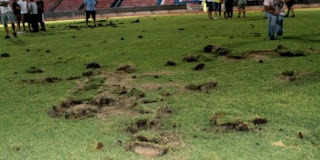 So, as fans of Panionios, you can't let a rival team use your pitch to earn glory for their club. How dare they?! Why don't you just grab 29 of your closest friends and then just destroy your own pitch so they can't use it. Smart. Real smart. Hate to tell these brilliant economic bailout recipients that if your pitch is ripped up, then your own team may, just may, get injured and perhaps the club will have to pay to fix the damage you did, so possibly, you'll see increased ticket prices with nothing to show in team improvement. Panionios fans, real men of genius. Just added some video footage I picked up from over at the Spoiler.